Welcome to THE TOWN OF COLTON, NEW YORK ! 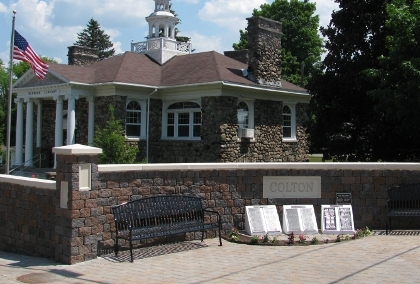 The Town of Colton, established in 1843, is one of the largest towns geographically in New York State. It lies in the southeast part of St. Lawrence County and straddles the boundary of the Adirondack Park. From the two hamlets of Colton and South Colton the town rises to meet the beautiful and scenic wilds of the Adirondacks. The town is blessed with natural resources and scenic beauty, including the Raquette River which flows from the southern to the northern end on its way to the St. Lawrence River. Seven lakes have been formed by dams along the river, providing recreation for boaters and anglers as well as power generation to help support all of New York. And hikers, campers, snowmobilers and others enjoy the many miles of trails maintained by public and private entities throughout town all seasons of the year. With strong civic pride, an excellent school, a range of municipal facilities plus well-maintained public highways providing access to nearby business , shopping and education centers it is no wonder that Colton is a great place to live, work and play. Go to NEWS for newsletters and more!